Many knowledgeable investment strategists maintain a specific segment of their fixed-asset portfolio beyond the reach of the cyclic patterns of the stock market. In order to accomplish this with a certain amount of safety, it is done through purchasing certificates of deposit, otherwise known as CDs. One of the most effective ways to ensure a long-term and lucrative return on this investment strategy is by incorporating what is called CD laddering. Everyone is certainly aware that interest rates rise and fall, and sometimes imperceptibly, or slow enough to pass from general notice. Should the economy maintain some period of inactivity or decline, which often reflects the interest rates being low as well, no investor would wish to acquire a long term length CD with the identical low rate structure. This is where laddering provides the most benefit. If interest rates stay in a prolonged cycle of low return, laddering allows the investor to maintain a positive edge on these low rates by tapping into the rate activity over a long period of time, such as many months or years, while preserving a good amount of liquidity in the process. The premise is based on longer term CDs usually having the highest interest rate applied to them, in comparison to a one year CD. The principle concept behind CD laddering is to build a structured time-line, as long or as short as is necessary, with its “rungs” denoting one year increments. In this instance, a ladder will represent five years of investments using a total funding of $20,000. Simply stated, a $4,000 investment would be applied to each rung of the ladder, each with the associated CD term length applied to it – one year CD, two year CD, three year CD, and so on. Over the course of the CD ladder time-line, after the first year, the one year term length CD occupying the first rung on the ladder will have reached maturity, along with each of the other CDs now having one year less before they reach maturity as well. To briefly itemize this, the two year CD now has one year remaining, and the three year CD now has two years remaining, and so forth. The next logical sequence in the ladder principle is to take the funds from the just matured one year CD, and “roll-it-over” into the empty 5 year ladder rung. By extension, each successive year of CD term activity requires the rolled-over CD to be placed on the rung standing the furthest out, which will be the five year rung in this specific example. In this scenario, the greatest monetary benefit is found on the highest rung of the ladder, which happens to hold the greatest amount of interest rate applied to it. The simplicity of this strategy rests on always being able to re-invest a specific portion of the whole, in this case one-fifth, when and if the economy is slow enough to bring the interest rates down proportionally. Therefore, the re-investment amount for that particular time-frame is brought back up to the top of the ladder, and reaping the most benefit in response to the present “downward” cycle. The critical component is allowing the laddering concept to coincide with cash or liquidity requirements with respect to the CD maturity guidelines. Do not allow financial emergencies to override the maturity time-frame, forcing the early withdrawal penalties to negate the benefits. In other words, keep a cash reserve handy to extend beyond the shortest CD term length on the lowest ladder rung. In addition, in times of low interest rate activity, it is best to keep the CD term lengths on the short side. 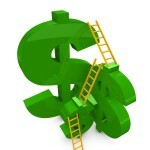 Therefore, an investor may choose to build their CD ladder in shorter increments, such as monthly instead of yearly rungs, say in 1 month, 3 month, 6 month, and 12 month steps, and so on, to suit both the economic atmosphere and cash flow requirements with maximum flexibility, and to maintain the best interest rate advantage possible.